Here is a comprehensive, interdisciplinary look at current bereavement care practices and key concerns of care providers. Covering a broad spectrum of topics, interests, and perspectives from divergent disciplines and clinical experiences, the contributing authors explore theories and constructs that can clarify and be useful in the provision of bereavement services. 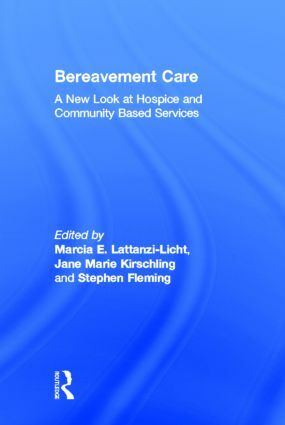 Bereavement Care: A New Look at Hospice and Community Based Services addresses important issues related to the delivery of bereavement care and services. Chapters focusing on clinical concerns examine ways to distinguish grief from depression and the use of Jung’s theory to expand an understanding of the grief process. Others explore options for community-based group interventions and the role of the volunteer in the provision of hospice bereavement services. Chapters with a research focus highlight effective assessment tools, the applicability of Bugen’s model, and the practice and problems involved in hospice bereavement services. This rich and compassionate volume will be helpful to mental health professionals, social workers, chaplains, nursing personnel, and volunteers who work with or provide services to bereaved persons and families.